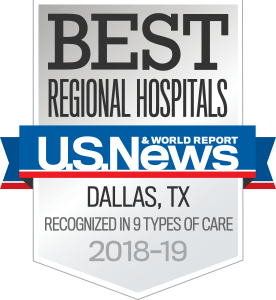 The medical oncology team at UT Southwestern’s renowned Harold C. Simmons Comprehensive Cancer Center offers its leading-edge general hematology and oncology treatment services at the Moncrief Cancer Institute in Fort Worth. Physicians, surgeons, oncologists, therapists, and others work in tandem to carry out groundbreaking research and deliver the latest, most promising therapies to fight cancer. At Moncrief Cancer Institute, patients receive the same high-quality, specialized cancer care from our multidisciplinary team of experts without having to travel to our Dallas campus. Our Forth Worth clinic offers lab services, imaging, radiology, infusion, medical oncology appointments, and an oncology specialty retail pharmacy. Our patients are encouraged to participate in Moncrief Cancer Institute’s survivorship program, which gives cancer patients the tools they need to survive – and thrive – mentally, physically, and emotionally. We provide one-on-one consultations with a specialized fitness trainer, dietitian, genetic counselor, social worker, physician assistant, and clinical psychologist. These services are specially designed to help survivors develop a healthy lifestyle and reduce their future risk of cancer. Most programs are provided at no cost – no matter when a patient was diagnosed – and are offered at both our Fort Worth facility and our Mobile Cancer Survivor Clinic. On the day of the appointment, please allow time for registration. We ask new patients to arrive 30 minutes early. Please bring a current insurance card, a method of payment (we accept checks or debit/credit cards only), and a complete list of current medications and dosages (including over-the-counter medications, herbs, and vitamins). To make the most of your time with the doctor, please also bring a list of questions. Please note: Children under the age of 12 are not allowed on the second floor. If you need to cancel an appointment, please notify us at least 24 hours in advance so we can accommodate other patients waiting to schedule an appointment. Self-parking is available, but there is no valet. It’s important that patients don’t run out of their medication. Be sure you have sufficient refills to last until the next appointment. We are happy to provide a written prescription upon request. If you run out of refills, call your pharmacy, and your pharmacist will fax a refill request to us. Please allow us 24 to 48 hours to process refill requests. Please allow 14 days for completion of all FMLA paperwork.